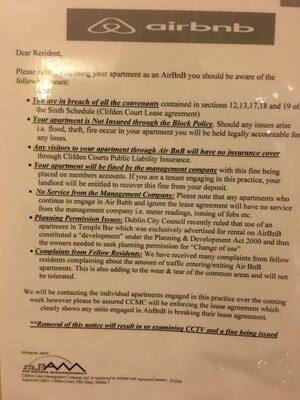 Not sure if this is of any interest but this went up in my apartment block recently. 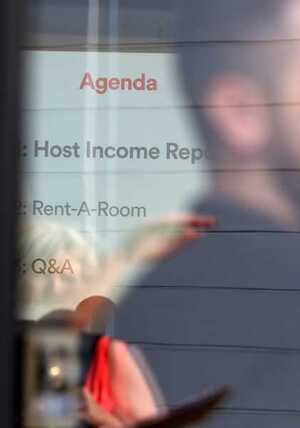 The company running the block has essentially outlawed Airbnb, even for apartment owners. Can they do this? Posted in Misc and tagged Airbnb, Apartment block at 10:56 am on October 12, 2016 by Broadsheet. Well, is it in the lease agreement? They claim it is. I don’t see them outlawing anything. More finger wagging than anything else. I could be considered subleasing perhaps. I reckon the lease they’re referring to is with regards to the property title, ie the document signed by the owner at purchase, as opposed to the rental lease. Thats exactly it- they are referring to the head lead lease which is signed by the first owner and the management company. Most standard rental leases for tenants have a provision in them that a tenant may not run a business from their apartment. It remains to see if the head leases have the same provision for owner-occupiers. The Nark of the Covenant. I agree with it though. AirBnB isn’t suitable if too many apartments in one block are offering it. It’s not safe for other residents. Would you want an apartment being rented by different party people every weekend? Lash up to Church Street with a copy of the lease agreement. a lot of traffic from the apartments? yea, i think you’re entitled to use your door as much as you like, as are your guests .. and your place is insured by air bnb, so theyre wrong on the insurance point too. 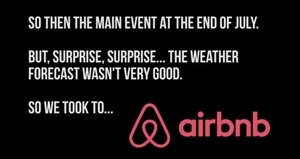 Airbnb isn’t insured in the normal sense, last I checked they had a guarantee but this is more for really bad PR newspaper story payments, and even then its incredibly difficult to get paid. Well the apartments are leasehold, so if you’re an owner, check the sections referenced. From reading it and their references to the main lease, insurance etc, I’d say they probably are correct, there is probably already a fines policy for breaches? If you are an owner renting out your apartment via 12 month lease or part 4 or whatever, it’s in your interest to advise/outline to tenants (potentially in their lease/rental agreement) any way that they would be breaching the main lease. Using Airbnb is subletting. If your lease forbids subletting then you are not allowed to sublet. That is straightforward. Whether you use a particular service to find a person to sublet to is irrelevant. May have jumped the gun there about the type of “lease” mentioned in the notice there. It seems this applies to apartments that have been purchased. It still comes down to what’s in that agreement though. In my opinion Airbnb more than 6 months of the year is not residential use of a property so should require change of use (which should be hard to get and impossible in apartment buildings). It’s still very common for flats to be sold on a long leasehold for the very reason that it’s easier to bind residents to covenants such as this and paying management company fees, especially once the original purchaser sells it on. Before 2009 virtually every flat was sold on a leasehold because the law on so-called “flying freeholds”, that is, freeholds that aren’t from ground to sky, was especially tricky. The 2009 Land Reform Act improved the position with enforceability of covenants on freeholders as well. off topic slightly..I had a car damaged by kids playing football in an apartments underground parking structure. grit stuck in the seams of the leather football kicked against the car on various panels left scratches. management company claimed they had nothing on their cctv to prove my claims. a electrician neighbor checked the camera, turns out the camera was not even connected. that I was not covered as a guest at the apartment. management companies appear to be staffed by 20 something relatives of the company owners reading of a script, who in turn usually have a connection to the original development company. I thought the horn rimmed types are above archaic interwebs retorts. In any case, Ivanka for pres 2020. I hope they are.people, (usually landlords) renting out apartments on AirBnB show scant regard for other residents living in the building. Also, it’s only a matter of time before someone trips and sues the apartment owner or indeed claim against the block insurance. I’m amazed that the OP thinks this is somehow a sinister development. Everything on BS is sinister. Particularly so if it involves “authority”, “the man”, “western capitalism” or something that someone owns that someone else thinks they should have. This latter falls under the rubric of “fairness”. There’s something like 2,000 AirBnB flats / houses to rent that pay landlords higher than renting out full-time to regular people. It would make a serious dent in the housing crisis if they reverted to that purpose. Whatever works in the rest of Europe doesn’t work in Ireland because the Apartment builds are of such a low quality. The average size is cramped (Britain and Ireland have the lowest average Sq meters per home in EU), poorly made dividing walls and flooring (cheap materials, short cuts), leading to too much noise from a busy Air B&B apartment. Also Irelands housing laws are so full of red tape, it seems that building management companies can make up any bunch of laws to restrict owners of apartments. This is the type of mentality that makes building new homes such a slow process. This is part of the mess we are in on the Housing crisis. I would be well pissed if there was an airbnb apartment in my block. Far too high a chance of noise and damage to the common areas.